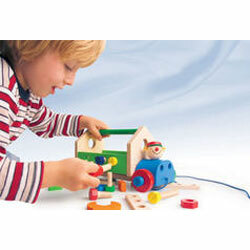 Europlay represents two well known brands of German Toys: Käthe Kruse and Selecta Toys. The Käthe Kruse Doll Studio is the oldest German doll company that is still existing and working in the traditional way. Handwork, simplicity of design, integrity, and an aversion to gimmicks and fads are still very much a part of how the dolls are made. 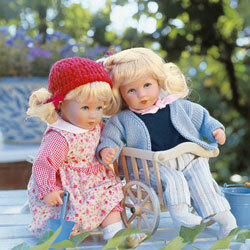 Each doll and item of doll clothing is made by hand and takes from 16 to 36 hours to make. During that time, it will pass through the hands of 8 to 10 craftspeople and artists. The name Kathe Kruse stands not only for classic dolls but also for unique and fun toys for children; toys from infancy to adolescence. While new and colorful Pamperines and the nostalgic Luckies belong to the novelties of this year, you can still find the classical Kathe Kruse towel dolls and cuddly toys. Come and join us in our ever-changing, always exciting, exceptional world of toys. Selecta Toys produces colourful multi-functional dexterity toys and many other enchanting products for the playroom to make children´s dreams come true. Many years experience and continual development make Selecta products unique. Selecta place a special value on natural materials such as wood, but does not hesitate to explore new materials to offer the best possible functions for its toys. Selecta toys and games are predominently produced in Germany. In their own production in Kirchsee, modern techniques and traditions come together with the know-how collected over many years of working with wood. The high value Selecta products originate from here with the love of detail which offers your child so much fun. Click here to see some of the products EUROPLAY CORP. has shared with ToyDirectory and TDmonthly Magazine. ©1996-2006 ToyDirectory.com, Inc.(R) All rights reserved. All logos, brands, and product names listed are trademarks and property of their respective holders.